Item # 316500 Stash Points: 295 (?) This is the number of points you get in The Zumiez Stash for purchasing this item. Stash points are redeemable for exclusive rewards only available to Zumiez Stash members. To redeem your points check out the rewards catalog on thestash.zumiez.com. Always win the circle game with your new secret weapon, the A Lost Cause I Owe You Sticker. 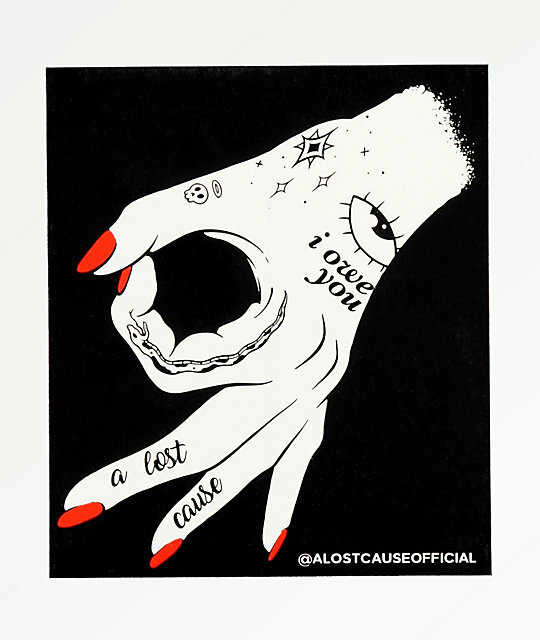 With the graphic of a tattooed hand forming the classic "circle game" gesture, you'll be punking your friends left and right in fun style. I Owe You Sticker from A Lost Cause. Hand forming "circle game" graphic with a black background. 4" x 3.5" | 10cm x 9cm (approx. ).